Maryland pet owners, rejoice! You have no shortage of excellent pet shops throughout the state to help make your furry friend’s life a little better. Come on in to any of the following 10 pet stores for exemplary service, selection, and supplies. The Pet Barn offers “natural foods and stylish supplies.” They have two locations, one in Fulton and one in Annapolis. Stop by for luxury and organic goods of all kinds. My Pet Store and More in Ellicott City sells all kinds of fantastic toys, medicine, food, and more. Stop in for all your horse, small animal, fish, bird, reptile, cat, and dog needs. Bark! is locally owned and operated and focuses on healthy pet food. 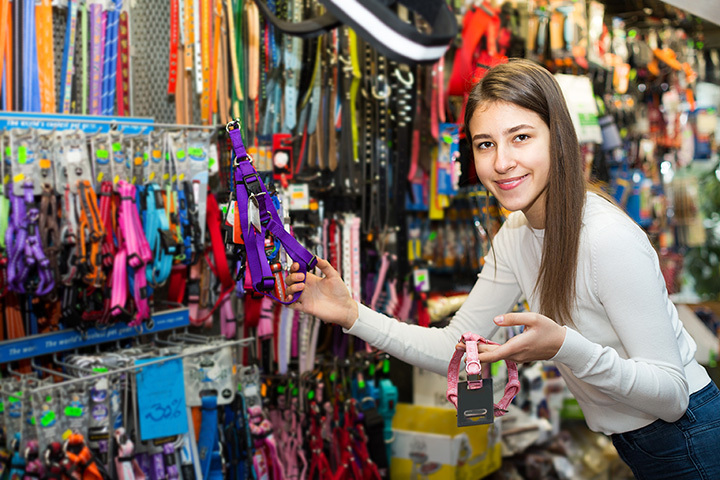 They also offer all kinds of wonderful pet supplies and toys. With eight Maryland locations, including Clarksville, Rockville, Gaithersburg, Pikesville, Olney, Silver Spring, Catonsville, and Annapolis, you’re never far from a Bark. Daddie’s Pets in LeVale, Maryland, offers a huge selection of amphibians, small animals, reptiles, and fish. In addition, they have a wide array of supplies for dogs, cats, small pets, reptiles, aquariums, enclosures, feeders, and more. Whole Pet Central is a regional chain of pet stores in Rockville and Columbia Maryland, as well as in Northern Virginia. Their tagline is “where healthy food comes naturally,” perfectly encapsulating their offerings: Healthy food for your dog, cat, or other small pet. The Grooming Place offers fantastic service and a wide selection of pet supplies. They’ve been in business for almost 30 years and recently added delivery and pet-sitting services. Crunchies Natural Pet Food is an award-winning pet shop with a focus on natural food. They’ve won Best Pet Products and Top Pet Shops from The Washingtonian and more. Expect fantastic brands like Bravo, Merrick, and Precise, among others. Just for Pets in Laurel, Maryland, focuses primarily on bird supplies and baby birds. For over 25 years, they’ve provided families with feathery friends. Check their website for available baby birds and a full product catalog. Bowman’s Feed and Pet carries a wide variety of world-class brands, including Taste of the Wild, Wild Delight, Blue, and more. They’ve got plenty of feed for all kinds of pets, including horses. Check their website for recent specials. Dogma services the Baltimore, Maryland, area with grooming services, pet supplies, and food for dogs, cats and large animals. Log on to the website to check for frequently updated special offers and a blog.